Do Green Houses Cost More to Build Than Regular Houses? 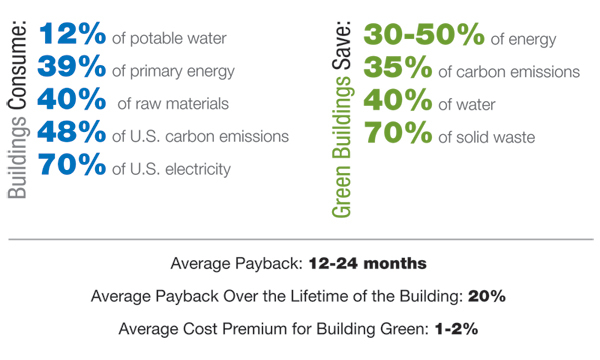 Sustainable building often seems more expensive than conventional building. Many of the building materials that make houses more durable and easier to heat and cool aren’t cheap. Complicated systems that allow a certain amount of energy independence–photovoltaic and solar hot water panels, for instance—can be very pricey. Common sense would tell most builders that it costs more to spray 8 inches of polyurethane foam in the roof than it would to install fiberglass batts. But appearances can be dec eiving. Take, for example, a decision to upgrade from double-pane to triple-pane windows. The windows will add thousands of dollars to construction costs. But they could eliminate the need for a warm-air register in front of each window, and the savings in labor and duct installation could offset the additional cost of the windows. In addition, the lower heating load means the size of the furnace can be downgraded. End result? Lower overall construction costs. Savings can come in other ways. Spending more money for more durable materials is cheaper in the long run because they won’t have to be replaced as often. Considering life-cycle costs, rather than focusing solely on initial costs, can yield some surprising results. Green building isn’t an all-or-nothing proposition. As long as the basics are there, the house can be upgraded over time. If solar panels are an intriguing long-term option but not in the cards right now, for instance, pre-plumb for the panels and install them when the budget allows.